How can I find out how much I owe for taxes? Payments must be made before the due date and are the responsibility of the assessed owner, even if a bill has not been received. How do I find my PIN or account number? You must notify the Tax Assessor’s office of any address changes for Real Estate, Tangible Business and Motor Vehicle and also notify the Department of Motor Vehicles of any change in your vehicle’s garaged location. I received my real estate tax bill, but I pay through my mortgage. Tax bills are mailed to the owner of record on December 31 prior to the July billing. Most banks or mortgage companies will get the tax bill electronically, and they do not request the bill. We recommend you contact your mortgage or escrow company to ensure that they do not need a copy of the bill. You may be required to send the mortgage or escrow company a copy of your bill. I received my tax bill but I applied for the monthly payment plan. All tax bills are mailed out before July 31 with the first payment due before August 31. Any taxpayer requesting the monthly payment plan will receive the monthly book in a separate mailing before August 31 with the first payment due before September 30. How are excise taxes calculated? Excise Tax is a tax on the privilege of registration per RI General Law 44-34-2. The value is determined by the Rhode Island Vehicle Value Commission per RI General Law 44-34-11 and is based on NADA values. The value is then reduced by the RI State exemption of $500. The value is then prorated by the number of days the vehicle was registered during the previous calendar year (January 1 through December 31). The tax amount is calculated by multiplying the prorated value of the vehicle by the tax rate. If you feel the dates of registration are incorrect on your tax bill, you will need to produce the cancellation receipt (TR-3) from the RI Division of Motor Vehicles and bring it to the Tax Assessor’s office. This document is needed to make any adjustments to registration dates on tax bills. I sold my car last year, why am I still being taxed on this vehicle? The current tax bill is for any and all vehicles registered from January 1 through December 31 of the previous year. For example, the 2013 tax bill that you received in July of 2013 was for and all vehicles registered at any time, between January 1, 2012 to December 31, 2012. The bill will be issued by the municipality where the vehicle was registered on December 31 prior to the July billing. Promptly cancel a registration when vehicles are sold, destroyed, repossessed or stolen to prevent any unnecessary tax. How do I appeal my bill? You may appeal your property valuation or your motor vehicle valuation through the Tax Assessor’s office before the deadline – no exceptions. If you are intending to appeal your tax amount, you must remain current with the amounts assessed. 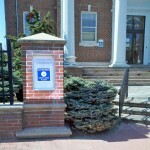 There is a Secure Drop Box in front of Town Hall to drop your tax payments at your convenience. Checks only please.